Whether you’re trying to reduce your carbon footprint or simply want to do your part in keeping the planet clean; there are plenty habits you can pick up to make your day to day life a little greener. Gardening is obviously a planet-friendly activity, so why not grow your own cannabis. By growing your own cannabis, you won’t need to rely on distribution systems that leave behind a large carbon footprint. Here are a few ways you can make your cannabis grow just a little greener. Be sure to compost all your old plant material. Homegrown cannabis can easily be composted with your other organic waste. When composted with other organic matter, it can produce a very nutritious soil amendment. By adding your leaves, clipping and old roots to your compost bin, you can eliminate all plant waste. If you’re concerned about nosy neighbors or suspicious smells, just mulch all the plant matter really well. This will make it unrecognizable and will help it breakdown faster. Adding organic matter such as compost to soil improves its water-holding capacity. Many people don’t recommend reusing soil for two reasons, it will be depleted of many nutrients and it could contain contaminants. A good soil mix will have many different organic bits in it, these bits breakdown and add nutrients into the soil. Your plant has already used up most of these nutrients by the time it finishes growing. To reuse your soil, you will have to remove all leftover plant material (you can add this to your compost). You will have to add fresh organic material to enrich the soil. By adding compost and manure you will enrich the soil with essential nutrients. A 50/50 mixture of old and new potting soil should do the trick. Make sure to mix it all well and break up and large chunks. Soil conditioners and amendments are also available and are a great source of additional micronutrients. 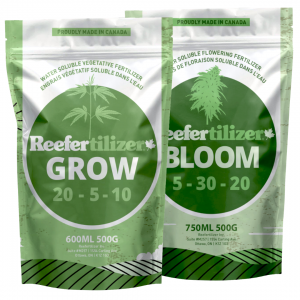 Reefertilizer start cannabis soil conditioner contains compost and myco which enrich the soil and help protect and develop new roots systems. You shouldn’t reuse soil that is contaminated or holding harmful critters. In some cases, you can pasteurize this soil by putting it in a black plastic garbage bag and leaving it in the sun. This will kill many of the living elements in your soil. Revitalizing and reusing old soil is an easy and great way to save money. If your growing indoors, you might want to consider using LED lights. LED growing technology has come a very long way in the last 10 years. The big pro about these grow lights is that they use a fraction of the energy of other light sources. Of course, the sun is the most efficient light source around, but we don’t all have the luxury of growing outdoors. Seasoned growers might produce a higher yield with traditional ballast lighting, but for smaller scale growers, the difference isn’t that extreme. LEDs are also very easily repaired, some soldering skills are required, but a LED replacement is cheap and quick. Outdoor plants can get to be very large. 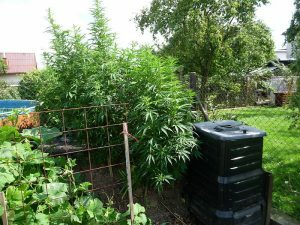 If possible, try growing your cannabis outdoors. Sunlight is the BEST source of light available, nothing manmade even comes close. By growing outdoors, your plant is growing in a natural habitat. No need to spend energy on lights or fans out here. Some keen monitoring is required, but outdoor plants typically grow much larger and faster than inside a tent. Start by finding a spot in an area that gets lots of sun during the day. You’ll want to dig a nice big hole, slightly larger than a 5-gallon planter. You will want to remove any large rocks or roots you find, as well as break up the surrounding soil. Replace the soil with your nutrient-rich soil mix. You don’t want to reuse any of the soil you dig up, it might contain bugs or other organisms that might not be good for your plant. 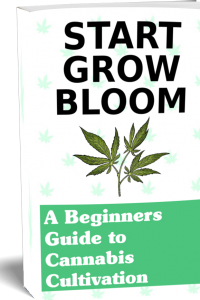 Learn more about growing cannabis at the cottage. Outdoor plants can grow VERY large, sometimes as large as a small tree like in the photo. When you buy nutrients for your grow, try to find ones that come in a minimum amount of packaging. Also, try to check if the packaging is recyclable. Many liquid nutrient programs require several different products in plastic containers. Products like Reefertilizer contain all the nutrients required in one recyclable bag, this means there’s less plastic that ends up in a landfill. Storing powder fertilizer in an opaque glass jar is an option if you don’t like messing with the resealable bag. As long as it’s airtight and stored in a dark place, powder nutrients have an almost indefinite shelf life. Liquid fertilizers are made up of mostly water. This increases their weight when shipping and increases their carbon footprint. 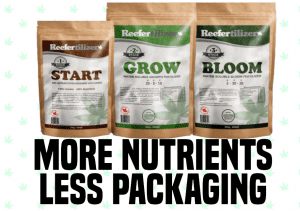 Learn more about Reefertilizer cannabis nutrients right here. 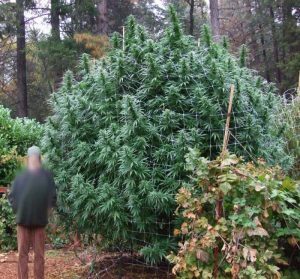 Sometimes people can go a little overboard when it comes to growing cannabis. One cannabis plant can yield you anywhere between 4oz to 20oz depending on the amount of light energy and the nature of the strain. If you’re growing for your own personal use, you might end up with a surplus of cannabis flower. Fresh cannabis has a shelf life of about 3-4 months before it starts losing potency. It’s cool to grow these huge plants inside, but if your needs are smaller you might be wasting energy. Growing one plant instead of 4 will save on energy costs, space, and resources. Instead of aiming for bumper crops, maybe instead go for being self-sufficient while using a minimum amount of energy to reach your goal. Do you have any tricks to make your grow a little greener? Comment below and tell us some of your tips to help the planet. Growing your own cannabis is a great activity and I believe everyone should have a closer connection to the things they consume. By growing your own cannabis in a green way, we can help remove the stigma on growing cannabis at home. In my opinion, growing cannabis should be treated the same as growing tomatoes or cucumbers. 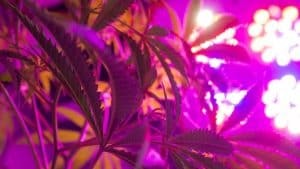 I live in Canada where it will soon become legal to grow your own cannabis at home. Many landlords are concerned about this, they are afraid of property damages and attracting theft. In reality growing cannabis at home can be quite safe and contained. 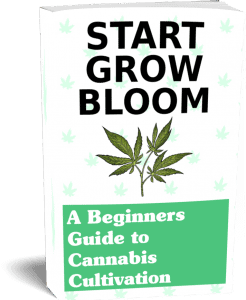 If you want to learn even more about growing cannabis, we offer a free 40+ page guide full of images. Get your today!